Ernst & Young today announced the transformation of its downtown Los Angeles office, which has been redesigned to foster more flexibility, collaboration and creativity for its professionals, of which 70 percent are millennials. The new office provides a variety of work settings and advanced technologies that encourage a flexible work culture, allow for growth and attract the best talent in Los Angeles. EY’s Los Angeles office, located at 7th and Figueroa Street in downtown LA’s financial district, is at the heart of the area’s expansive revitalization. According to the EY report, Downtown Los Angeles on the Rise, the activity, investment and growth there isn’t slowing down. The new design features themed rooms and floors that pay homage to key Los Angeles landmarks such as the iconic Capitol Records Building, Watts Tower and the eclectic style of Abbot Kinney Boulevard. Over 50 percent of the new workstations are ergonomic sit-to-stand desks and the tech-enhanced workspaces allow for more mobility, teaming and efficiency. 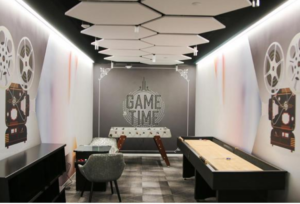 In addition, innovative office amenities include a vintage-inspired arcade game room, coffee hub with café-style tables, themed collaboration rooms, three wellness rooms, interactive art walls, greenery and natural light incorporated throughout the workspaces, and panoramic views of downtown. 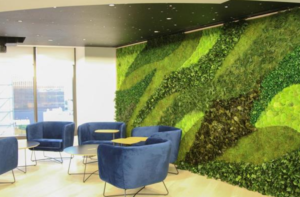 The Los Angeles office redesign is part of the [email protected] initiative, emphasizing EY’s dedication to providing energizing and efficient environments for its workforce. EY believes that offering its people more choice in where, when, and how work gets done allows them to better deliver exceptional client service, whether individually or as part of a team, and better supports their well-being. The EY Los Angeles office is among the first of several West Coast offices, including San Diego and Salt Lake City, to transition to the [email protected] environment, which has been rolled out to hundreds of EY locations worldwide.